The kind designers of the NOOK Tablet made sure you don’t need a post-graduate degree in engineering to install and format a microSD or microSDHC memory card. You can get to the card slot without removing the back cover; you need no tools other than your fingers. SD and SDHC are known as flash memory. That means once data is recorded, it remains in place even when the power is turned off. Do buy a microSD or microSDHC card. Don’t buy an SD or miniSD card. Don’t buy a microSDXC card. Technically this isn’t required, but it is a good practice anytime you’re working with electrical devices. Cover a well-lit, clean, level surface with a soft cloth. Lay the reader face down on the cloth. Make sure there are no cups of coffee, soda, water, molten iron, or anything else that could spill onto your tablet. Find the small gray protective cover near the open curved corner. 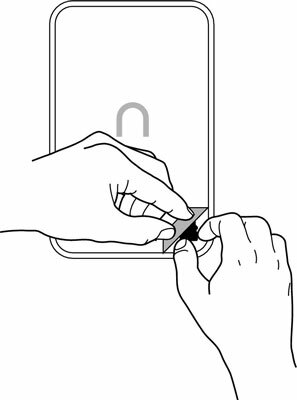 Using the tip of your finger, gently pull the lip open and fold it flat against the back of the device. Hold the memory card with the logo facing up toward you; carefully slide it into the slot. Push gently against the card until it’s fully in place. Don’t force it into place; if you have the correct memory card (a microSD or microSDHC), it should fit easily. If it looks about twice as large as the opening, you’ve got the wrong card. Micros only need apply. Close the small gray lid and snap it into place. To remove a memory card from your tablet, follow the first three steps for installing a card and then carefully slide the card out of its slot. Place the card in the protective case it came in (or in a clean plastic bag) and put it away for future use. Close the small gray lid and snap it into place. Your new microSDHC card may come formatted (a process that electronically indexes its memory so that the computer inside your tablet knows where to store or retrieve information). If you install an unformatted microSD or microSDHC card, the NOOK Tablet shows you a warning. No biggie: Use the Format command. Tap the Format Now button. You’re asked if you are sure. Sure you’re sure!